@Tsim Sha Tsui | Get Your Grub On! Without fail this is the one place I always come back to since my first time I visited Hong Kong when I found this just around the corner of the hotel I stayed at in Tsim Sha Tsui. The noodles here literally burnt themselves into my memory as I firstly underestimated their spice level and paid the price for it big time. It was supposed to be breakfast but since I stayed in Sheung Wan this time around the trip to Kowloon pushed it all more into the lunch zone. For the first time I didn’t challenge myself going up another spice level as I really wanted to taste all the ingredients for once, pure self-discipline. Because I couldn’t 100% figure it out I researched what ‘Yunnan‘ or ‘Crossing the Bridge Noodles‘ broth is usually made of and many sources suggested that it comes from boiling a fat chicken together with pork bones which totally made sense knowing it. I thought there was some beef stock in there as well though as the soup had this natural sour touch to it. The spicy minced pork I added gave it just the litte pep it needed without making me sweat and added extra meaty flavors to the dish. I went full on with the greens and loved the extra portion coriander, leek and green onions that enhanced the whole thing with freshness. 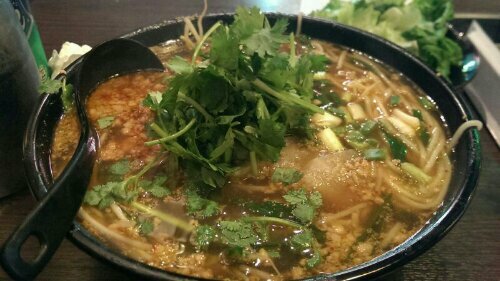 All above the noodles were plenty – naturally I ordered large – and awesome. They were thin and surprisingly springy and chewy considering the steaming heat of the soup should have cooked them to mushy strings, I was happy it didn’t. Now that I know how the original base tastes I can return to climbing up the nine spoke ladder picking up at level seven where I last left off. I will be coming back here every time again and again as it is still under my top favorite bowls of noodles in Asia and never gets old or boring. “Very spicy” here I come.